Onions are cooked both to be eaten on their own and to be added to other dishes. Onions may require sweating, sautéing, or caramelizing before they are added to other foods. They can also be boiled, fried, baked, deep-fried, and grilled alone or together with other foods. 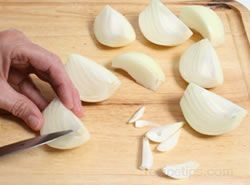 Some of the methods commonly used for cooking onions are shown below. Sweating onions is done to accomplish for several purposes. Sweating gently cooks the onion to soften its texture, increase its sweetness and to reduce the sulfur content, which gives it a milder taste. Sweating onions for dishes, such as risottos, rice pilafs and braised meats is where the flavor begins. The sweat onions give a natural sweetness to dishes. See the instructions below for sweating onions. Slice or chop onions as directed by the recipe. Add just enough fat (oil or margarine) to cover the bottom of the pan. If too much fat is used, it will smother the onions. Add prepared onions and cook over low heat. Cover to keep onions moist. Remove cover and stir occasionally. Do not allow onions to brown. Cook until the onions are translucent and soft but have not started to brown. 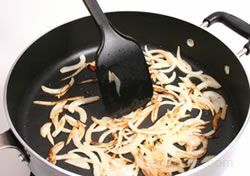 Sautéing onions is done when a firmer textured and sweeter flavored onion is desired. The sautéed onions are browned, which creates a rich sweet flavor. 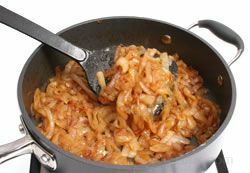 Sautéed onions are good when added to other sautéed vegetables, soups and pasta dishes. 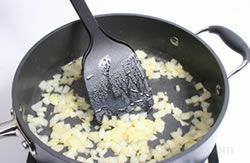 See the instructions below for sautéing onions. Heat the pan over high heat before adding the oil. 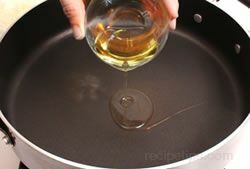 Add enough oil to just coat the bottom of the pan. Add the onions but do not cover. Covering them would steam the onions and prevent them from browning properly. 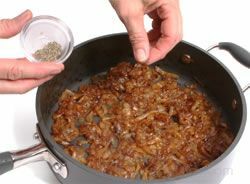 As they begin to brown, stir frequently to produce evenly browned onions. Cook until tender and evenly browned. Serve as a side dish or add to other dishes as directed. Caramelizing onions creates a unique flavor. Once the onion's sugars have caramelized, there are many flavor compounds developed that provide a variety of sweet, rich flavors. Each flavor compound has a color and flavor of its own that adds depth to any dish in which the caramelized onions are added. 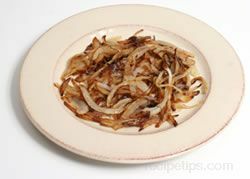 Caramelized onions are used as a condiment on hamburgers and other sandwiches, and as a topping on pizza, steaks, pork chops, and roasted meats. 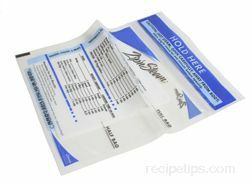 They are added to add flavor to risotto, pasta dishes, soups and stews. 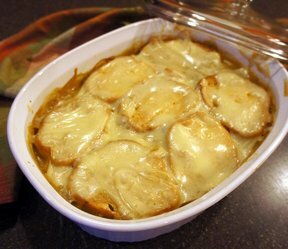 They also make a nice side dish to meats, poultry, and fish. 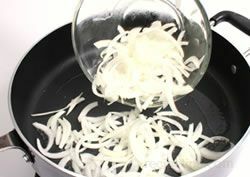 See the instructions below for caramelizing onions. 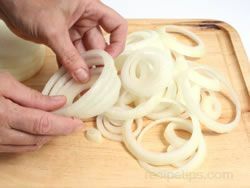 Cut 1 1/2 pounds of onions in half lengthwise and peel. Cut onion halves crosswise into 1/4 inch slices. Separate the layers of each slice into individual pieces. 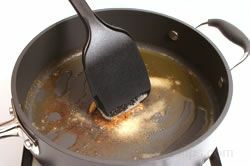 Heat 1 tablespoon of vegetable oil and 1 tablespoon of butter (or margarine) in a 10-inch non-stick fry pan over high heat. 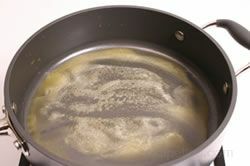 When oil and butter are heated and foaming stops, add 1/2 teaspoon of salt and 3/4 teaspoon of light brown sugar. Quickly stir to mix. Add the onions and carefully stir to coat them as thoroughly as possible. Cook over high heat for approximately 5 minutes, stirring occasionally. Onions will begin to soften and release some of their juices. Reduce heat down to medium. Continue to cook, stirring often. 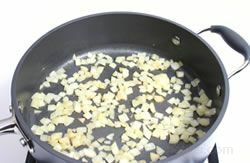 Note: During the cooking process, if the onions begin to cook too fast and begin to scorch, reduce the heat immediately. If they are cooking too slow and have not started to brown after 20 minutes, increase the heat slightly. Cook until onions are soft, have a glossy look, and are a deep, rich brown color. This may take 40 to 50 minutes. Do not rush this process or the results will not produce onions with the varying layers of color and rich flavor. 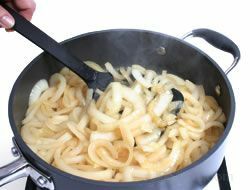 When onions are done, remove from the heat and stir in a tablespoon of water. Add pepper to taste. 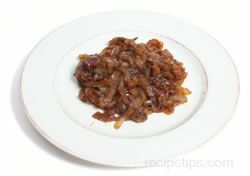 Caramelized onions can be eaten as a side dish on their own or added as a topping to meats, such as steak or chops. 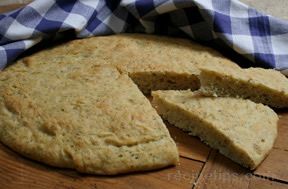 They can also be added to sandwiches, soups, stews and other dishes to provide a special flavor. Peel 1 large onion, cut in half from stem to root, and then cut crosswise into very thin slices. 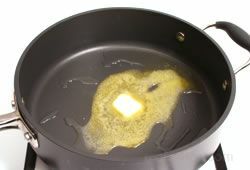 Heat 1/4 cup of butter or margarine in a 10" frying pan over medium heat. 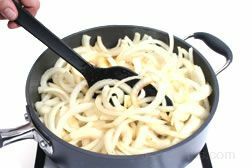 Place small batches of the thinly sliced onions in the pan and fry until crispy and golden brown, approximately 3 minutes. Stir constantly. 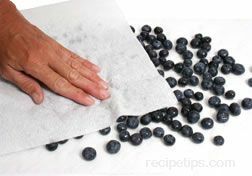 Remove with tongs and place on a plate lined with paper towels. Continue to fry in batches until all the onions are fried. Peel 3 large sweet onions, leaving them whole. Cut crosswise into 1/4 inch thick slices. Separate slices into individual rings. Dry separated rings thoroughly with paper towels. After thoroughly drying rings, dredge them in flour. This can be done by putting flour on a plate and placing the onion rings in the flour and turning until well coated. 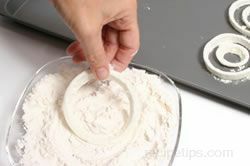 If you have a lot of rings to dredge, it may be faster to put the flour in a bag and then place several rings at a time in the flour. 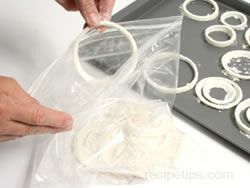 Shake the bag until all rings are well coated and then remove the rings from the bag. Mix 1 1/2 cups of flour, 1 1/2 tsp. of salt, 1 1/2 tsp. of baking powder, and 2 tsp. of sugar in a bowl and set aside. 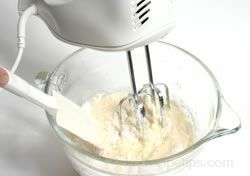 Blend together 2 eggs, 1 1/4 cup of milk, and 1/4 cup of vegetable oil. 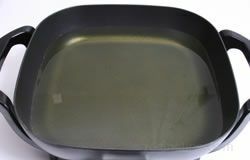 Add 1 inch of oil to a deep-sided pan. Heat oil to 375°F. If oil is not hot enough, the onion rings will be greasy when cooked. 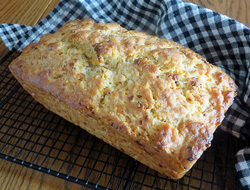 If it is too hot, the batter will brown too quickly and the onions will not be cooked thoroughly. 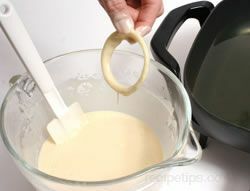 Dip flour coated onion rings into the batter until entire ring is coated. Allow excess batter to drip off before placing in the hot oil. Place batter coated rings into the hot oil. 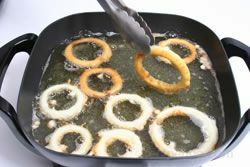 Place several rings in the hot oil at a time but do not overcrowd the rings. This will allow them to cook evenly. 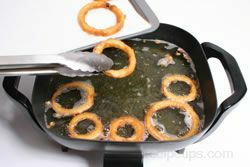 Fry rings rings until they are golden brown on the first side and then turn to cook on the second side. 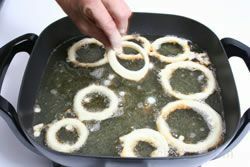 When rings are golden brown on both sides, remove the rings from the oil and place on a paper towel lined baking sheet for oil to drain off. To keep hot, place baking sheet, with finished onion rings, in an oven preheated to 300°F until all rings are done. When rings are done, serve immediately while hot. 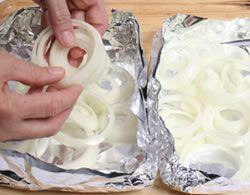 Place whole onions in a baking dish. 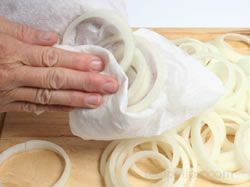 Leave onions in their skin but remove any dry papery outer layer. Place onions uncovered in a preheated 425º F oven. Bake onions until tender, 40-50 minutes. Check doneness by poking with a toothpick. Trim ends of onions and peel. To help onions stay intact and hold their shape better, cut an X into the stem end of the onion. 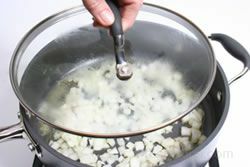 Place the onions in the boiling water and reduce heat to a gentle simmer. Do not boil rapidly. 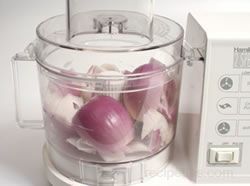 Cooking time may range from 10 minutes to an hour, depending on whether the onions are small pearl or boiling onions or if they are larger onions, such as a Spanish onion. 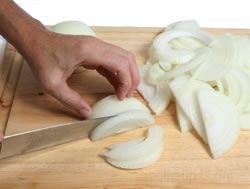 Peel and quarter onions as shown in Onion Prepartion - Cutting into Quarters. 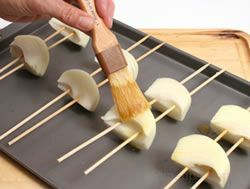 Soak bamboo skewers in water for at least 30 minutes before placing onions on them. 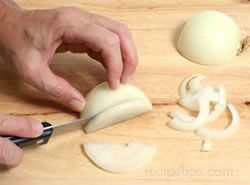 Remove the small center section of each quartered onion using the tip of a knife. This will make it easier to place the quarters on the skewers. The small center core pieces will generally fall off when trying to place the onions on the skewers if left on the quarters. 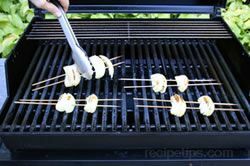 Use two skewers for each quartered onion. 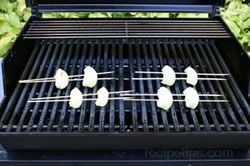 Using two skewers will prevent the onion sections from turning on the skewers when grilling. 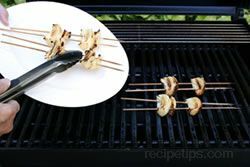 Place onion slices on water soaked bamboo skewers by carefully threading a skewer through each end of the onion, being careful to catch all layers with each skewer. Coat the onions on both sides with a mixture of 1/2 oil and 1/2 melted butter. Place the quartered onions over indirect medium heat. Cook for 20 to 30 minutes. Using tongs, grab hold of the skewers and turn the onions every 5 minutes. The onions will continue to brown with each turn. Cook until onions are tender-crisp and lightly charred. 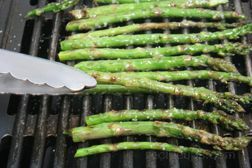 Remove from the grill and serve immediately. If the outer layer is badly charred, remove it before serving. Peel two medium size whole onions. Slice into 1/4 inch thick slices and separate into rings. 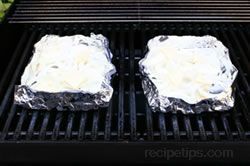 Make two trays from aluminum foil. 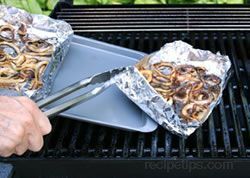 Use double layers of foil and turn up at least 1 inch on all sides. Seal the turned up sides in each corner by folding corners and squeezing together tightly. Place half of the sliced onion rings in each tray so they are evenly distributed. Add approximately 1 tablespoon of margarine to each tray. 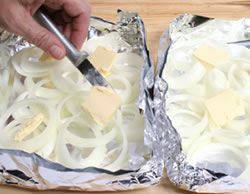 Cut each tablespoon of margarine into quarters to distribute evenly throughout the tray of onion rings. 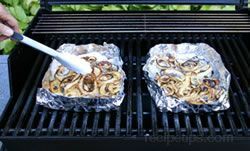 Place the foil trays containing the slices over direct medium heat. Cook for 30 to 40 minutes. After the first 10 minutes, turn the slices using a tongs. Be careful when turning that the foil does not get punctured. This would allow the margarine to run out of the foil trays. Do not use a fork for turning because there would be more of a chance of puncturing the foil. 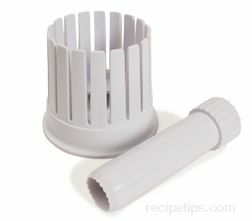 Continue to turn the onion slices about every 5 minutes. 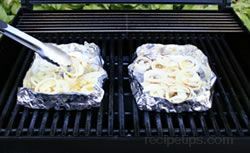 When slices are nicely browned, remove the foil trays from the grill and serve the onion slices immediately while still warm.